Over his fifty-year career, internationally renowned American sculptor Stephen De Staebler (1933-2011) created totemic sculptures that explore the fragility of the human condition and our unparalleled capacity to persevere. His fractured figures—which draw on a diverse artistic lineage that includes the art of ancient Greece, Egypt and the Americas, Auguste Rodin, and Alberto Giacometti—hold a series of contradictory ideas in tension: earthly monumentality and spiritual transcendence; frailty and strength; and the primordial and the modern. For over four months, five well and lesser-known bronze sculptures by De Staebler will inhabit Montalvo’s century-old historic estate. 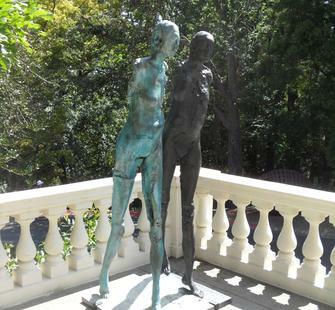 Placed throughout the grounds, from the steps of the Front Veranda of the Historic Villa to the bottom quadrant of the Great Lawn, De Staebler’s sculptures convey the fragility of human experience, the struggles of earthly existence, and the inevitability of our own mortality. Yet they also suggest the possibility of transcendence despite our earthly limitations. The armless or headless torsos of many of his figures sit almost magically atop gracefully elongated legs reminiscent of the exaggerated anatomy found in Italian Mannerist paintings. The preternatural, almost ethereal quality of these limbs, together with the occasional appearance of a winged appendage, as in Winged Figure Ascending (2010) and Figure with Stunted Wing (2010) seem to affirm humanity’s kinship to a divine other. 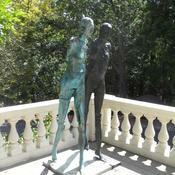 De Staebler’s distorted representations contrast with the idealized depictions of the human form seen in the small group of Neo-Classical figurative sculptures found on Montalvo’s grounds, which are the remaining traces of an art collection created by late California Senator James Duval Phelan (1861-1930), the property’s original owner. Fragmented and disfigured remains of sculptures from classical antiquity serve as one among many art historical references for De Staebler’s work. Like these historical antecedents, Montalvo’s sculptures have also been eroded by the passage of time. De Staebler’s One Legged Woman Standing (1982/85) finds a home among a classical depiction of the allegory of the Four Seasons, replacing the figure of summer destroyed during the 1989 Loma Prieta earthquake. A resident of the Bay Area since the late 1950s, De Staebler studied under legendary ceramic artist Peter Voulkos at the University of California, Berkeley, and was an important participant in the California Clay Movement. Along with artists like Voulkos, John Mason, and Kenneth Price, he played a vital role in helping to redefine ceramics as an art form through innovative construction, glazing, and firing methods. As early as the 1960s, De Staebler began experimenting with bronze. He returned to the medium in the late 1970s and 1980s and began exploring new techniques that allowed him to retain the cracked earthy appearance of clay while constructing more monumental forms. De Staebler cast into bronze hundreds of fragments of arms, legs, wings, and ‘earth forms’ originally made from clay and wax; he then used this library of fragments to create entirely new forms, adding, subtracting and modifying as if he were still ‘modeling’ the material. Through this artistic process, De Staebler developed a signature aesthetic recognized today as uniquely his own. Metaphoric States: Five Bronze Works by Stephen De Staebler is organized by Montalvo Arts Center in association with Dolby Chadwick Gallery, and the Estate of Stephen DeStaebler. It is presented as part of Montalvo’s Art on the Grounds exhibition program and is organized in association with the new series Breakthrough: New Visions in Contemporary Sculpture, which features temporary exhibitions showcasing existing work by some of the world’s most prestigious and innovative sculptors. Past exhibitions in this series include Chuck Ginnever: Rashomon (2013). The exhibition is made possible thanks to the generous support of: Ann & Gordon Getty Foundation; William and Flora Hewlett Foundation; James Irvine Foundation; McKnight Foundation; National Endowment for the Arts; David and Lucile Packard Foundation; and Myra Reinhard Family Foundation.